Guns N’ Roses closed out their “Not In This Lifetime” North American tour at Qualcomm Stadium in San Diego, CA on Monday. The band's live lineup is rounded out by guitarist Richard Fortus, drummer Frank Ferrer, and keyboardists Dizzy Reed and Melissa Reese. 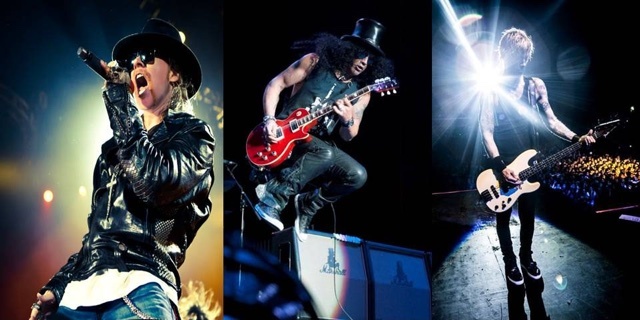 Guns N’ Roses will next launch a series of South American shows in Lima, Peru on October 27 and they have just announced a pair of dates in New Zealand in early 2017. The group will play Westpac Stadium in Wellington on February 2 and Western Springs in Auckland on February 4. Ticket pre-sales begin August 24, with tickets and VIP packages on sale to the general public on August 31 at 10:00am local time. The New Zealand dates fall between a series of three shows in Japan in January and the start of an Australian tour in Brisbane on February 7.